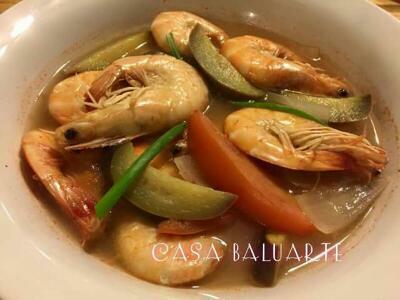 Sinigang na Hipon is a Filipinos favorite easy recipe. A simple yet very satisfying dish! Give it a try and enjoy. 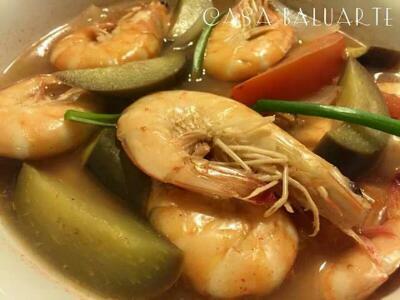 You can also add some vegetables like sitaw, talong or any vegetables desired. This recipe I added 1 medium size eggplant, cut into bite size. I added it same time with the onion and tomato. Using a medium saucepan, bring water to boil in medium heat. Once it start boiling add onion, tomato and simmer. Season with salt, pepper and sinigang mix. Simmer for a minute. Add shrimp, simmer till shrimp turns pinkish. Add green onion, simmer for a minute then remove pan from heat.